BSJ | Should memorials last for time immemorial? No, and when they should end. Should memorials last for time immemorial? No, and when they should end. We are past the poppy. Remembrance Day, in so far as it looks to commemorate the soldiers of the First and Second World War, is no longer important to British society. Its value as an act of Remembrance is exhausted. Yet, each year, we pay homage to its badly-framed discourse, strangulated by its centennial tentacles which reach well beyond the despair of the period’s slaughter. Our society’s ability to remember as a collective is the equivalent of a torch: we bear it to shine light on our past mistakes and direct our future course. In 2019, Remembrance of these wars is but a derisory flicker: a bendy-necked desktop light wafting out rays as pasty as the gammon faces of those who work the switch. Its hue hangs sickly on all matters – Brexit, sport, UK identity- and hums a shallow message: we, the plucky Tommies, will colonise or, if prevented, triumph over the barbarians: be they Hun, European or aboriginal. It’s a pathetic and dangerous story to tell our children. It closes out meaningful reflection upon our nation’s actions and inculcates a ‘chosen-nation’ mentality. This helps to breed the nasty undertones we see in contemporary UK society. On matters of Europe, migration, [insert any major political issue], we are trapped in a thicket of our own making, unwilling to test the official account of our past and make better sense of our futures. Stuck in this stasis of nostalgia, we will choke on the cords of our collective memories. Remembrance is not necessarily a bad thing in both of its guises; for there is a distinction which needs to be made. remembrance (with a small ‘r’) is a personal, familiar and subjective experience. It is, the dead family member; it is, missing the loved one as you miss a body part; it is, a life under stress which changes, as melted wax, cools into an unfamiliar shape. We all have these experiences at some point within our lives. They are sad and they will scar us but, this remembrance is no bad or evil occurrence; it is part of life. Remembrance (with a capital ‘R’) is different. This type of Remembrance is a public experience. Here, the institutions of social power take a collective charge for society’s senses; the army, government, schools, press and in our case, royal family, direct the populace to hold an objective version of a collective memory. This remembering is not a history lesson concerned with the differing accounts and facts of the matter. Rather, it is an emotive and definitive version of events which seeks to mirror the society’s view of itself; this Remembrance projects how we want to be remembered and therefore, suggests where we would like to be in the future. Again, in and of itself, it is no bad or evil occurrence but as with any tool (in this case, a societal tool) it can be used for negative means. 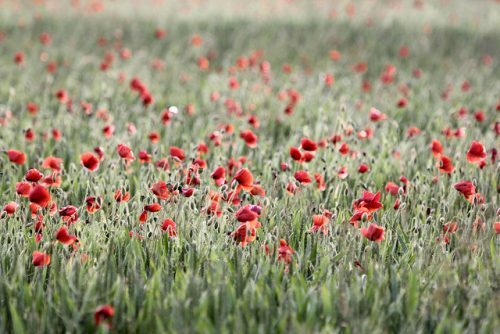 How can Remembrance be negative? The way in which a Remembrance project is framed and communicated is a construct: a political choice of our societal institutions. Where such a vastly political project occurs in a democracy, there is the requisite moral duty to consult and engage the people. Provided this is done, then Remembrance is unlikely to furnish a negative result. In fact, where done openly in public, it can be quite the unifying and useful experience for a society. However, over the last twenty years or so, the quiet, neat trick of ‘Project Poppy’ has been to present the current Remembrance account of both wars as a projection of absolute truth, requiring no critical consideration. Should any arise publicly, it is quickly shut down as traitorous or insensitive (depending on the political leanings of the condemner). Just ask the footballer, James McClean who has refused to wear a poppy on his shirt since 2011 and suffered caustic abuse as a result. Blame for this situation can be rightly apportioned to our societal institutions; indoctrination starts from an early age. Each November, school’s senior leadership encourage their teachers to run assemblies and show their students videos on both wars, largely produced by the state’s broadcaster, the BBC. As adults, the news on our phones, on our TVs, in our newspapers persists in upholding the narrative and even the sports arenas and business parks stand silently still for two minutes. Ultimately however, the institutions of society are only giving the people what they want: a constructed narrative which gives meaning to our actions. If humans were more aware of our narrative nature then we would be more likely to understand that Remembrance(s) can be a worthwhile political project if directed towards pertinent, contemporary issues. All individuals, families and societies tell themselves stories. It is meaning-making and humans are very good at it. It helps our societies to co-exist, to act individually, collectively and prosperously. It is a necessary aspect of the human condition and should be more readily taught to our children. The institutions within our society act like our conscious minds: narrating our collective stories, creating memorials that form identity, preserving the reasoning for society’s existence and crafting a set of values to aim for. Such institutions are really good at understanding how to target our emotional selves; they know, that if you want something to stick with the people, make them angry or make them cry. This technique can be seen to be employed where reality and the narrative is blurred; true qualitative accounts of both wars are fashioned into an emotional collective narrative: Remembrance co-opts remembrance. We are shown interviews of war veterans recounting their miserable and maddening efforts in war. We hear from their spouses, sons and daughters as they pick through their deceased’s’ last correspondence. Their raw memories are made into our collective memories: I become that widow; I am from that town the soldiers marched through. I am them or at least, the product of their efforts. Consequently within our society, the Remembrance project of Great War and WW2 has instilled within the populace such an emotional and moral duty of reverence that it has excluded public evaluation of the actions which led up to and constituted both wars: where are the vox-pops of people who doubt the worth of the soldier’s deaths? The children’s presenters appraising the actions on both sides? The cessation of WW1’s Remembrance Project as supposedly floated by Danny Boyle prior to the centennial last year? As I have said, Remembrance, in the form of an emotional projection of values onto a society, is no bad thing. It helps society to gather around ideals and reject views and actions that society wishes to expunge. But where the people are spectators to a Remembrance Project that is no longer pertinent to today’s society, then the project should end. The importance of the Great War in as much as it had value as a Remembrance project , is found in the idea that nation states leaning together in a balance of powers should not be allowed to claim human life as expendable in the furtherance of selfish and uncertain diplomatic causes. Of course, the hideous irony of remembering that message in 2019 should not be lost on anyone. In the machinations of Brexit, those diplomats wilfully unconcerned with the plight of others are ten a penny. However, contemporary Remembrance of WW1 can hardly be said to be directed towards heeding that warning. Occasionally, a critique of the diplomats, ministers and institutions driving WW1 gains a public airing but ‘Blackadder’ and ‘Oh! What a Lovely War’ are in no sense part of the official Remembrance project. Instead, Remembrance of WW1 today has been co-opted by social institutions (notably, the press and political class) to present a ‘can-do’ British attitude; the work ethic of the Victorians with just a slight whooping cough of Brunel, coal mining and Empire. The death of the soldiers is ancillary to the message that the British are doers who triumph and grow. When the world gives us lemons, we strong arm the owner to sell their entire plantation to us under the auspices of the British navy and make a fortune on lemonade. Dutiful and self-aware members of our democracy should seek to radically alter this narrative (a white poppy, perhaps?) or consign contemplation of the Great War to the history books. There, the Great War can take pride of place as the example of (poor) policy making and Empire decline which may or may not have led to Britain’s role in today’s world. Freed, the Great War will become our history- to be reflected on, discussed and argued over; it should become our children’s memories. Remembrance of WW2 and the Holocaust. Unfortunately, Remembrance of WW2 has also become tainted by a similarly toxic message. Its focus, directed towards similar visions of British stiff-upper lippery, blinds our populace to some of the truly tragic events to have occurred within those six years of war. Those people on boats, in camps, coming over here. Those people on benefits who shouldn’t have all those children. Those people other than us. Them and us. The Nazis used all the might of their political apparatus to ensure that subsects of their society – the Jews, the Romani, the disabled – were demonised within the general population; now, certain factions within British (and Western) public life are doing the same. The difference is that the modern politicians and commentators do not believe in the things that they are saying: their use of hateful and divisive language is mainly utilised for political expediency and personal gain. Is Boris Johnson a true believer in the ‘science’ of Eugenics? I don’t think so. Is David Davis a racist? Certainty, some of his (and their) rhetoric is suggestive but this language is not a manifestation of their principles; first, they need to have some. Instead, their goal in fomenting this division is to further their agendas and/or line their pockets. As careerists rarely missing an opportunity, they cloak themselves in a Remembrance project defined by images of Churchill and Spitfires, of the Dunkirk spirit, of Keeping Calm and Carrying On. Cloaked, they receive the reverential protection afforded to the dignity of the soldiers’ deaths because, we must not denigrate the brave actions of our soldiers by rejecting what is palpably clear: British exceptionalism. In our attention-scarce world, it is this trick which further condemns WW2 Remembrance to irrelevancy. If only we could see and discuss the pertinent questions and considerations a useful WW2 Remembrance project would encompass: the speed with which humans were able to condition themselves to commit a thousand murders in a single day; the devastation wilfully wreaked in the incineration of entire cities; the recklessness with which one collection of societies were happy to spend the greatest amount of money ever spent in human history on the destruction of another. It is this, alone, that will ensure that a Remembrance project remains relevant; it must call upon people within our democracy to consider what they really want for the society and it must do this within an environment that is open, respectful and tolerant. Undoubtedly, International Holocaust Day should be front and centre of the this; alongside the actions of both anti-fascists and conscientious objectors. Currently as a Remembrance project, WW2 has lost its societal value; devoid of meaning, it has been co-opted for partial political means. It should end. Why should we waste our finite collective political action on a false and useless memory? There are more pressing requirements. How about each March 20th commemorating the death of the last ever Northern White Rhino as an example of humanity’s crazed need to meddle with our environment to the detriment of all other living things, including us? For me, if our Remembrance projects are to serve any purpose, it is to keep fresh in our memory our fragility and stupidity. We could start by re-examining the stories that we want to tell ourselves and ask what is important to today’s world.